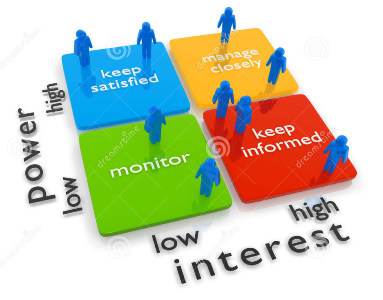 Stakeholder analysis is an important initial step in project work as it is a process that can provide insights into and an understanding of the interactions between a project and its stakeholders. This tool can identify and prioritise which stakeholders can have impact on the project’s success and is often the first step in project planning. It is also important for developing engagement strategies for building and maintaining the networks necessary to achieve project outcomes. It makes for a clearer understanding of the range and roles of project stakeholders. The tool is a revised stakeholder analysis tool to systematically or strategically asses the human and social capital resources required to deliver projects and to address gaps typically found in stakeholder analyses, which have tended to focus on the target population for projects. 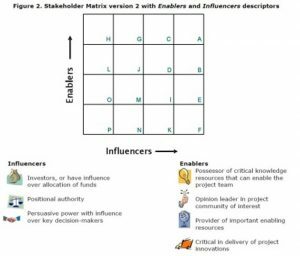 Prioritise stakeholders: this requires the project team to use a stakeholder matrix to prioritise a list of stakeholders in terms of how critical they are in influencing the delivery of project outcomes, which then assists in prioritising communication and engagement activities. Understand and manage stakeholders: considering stakeholder attitudes towards the project and any risks associated with their participation, if risks are identified, the process asks to consider what engagement strategies need to be put into place to minimize risks and increase their participation. Implementing the tool requires a high level of commitment by project team members, as the process may be seen by others as too systematic and formalised. However the more effort that is put into the process, the more the team is likely to benefit from such an activity. The developers suggest the best way to incorporate the tool into project work, is to have a team member ‘champion’ the process.